This document is suitable for any organisation in any business. This consultancy contract is for use by a business or any other organisation to take on an IT consultant. It is drawn with a view to the consultant being a company, large or small. It is drawn with a view to a tough line to favour the client in every area. Of course your industry sector affects the work you want to instruct your IT consultant to do. But this is a legal document, not a specification for work. 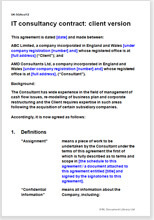 This contract is for a client to present to his consultant. See below for alternative consultancy contracts. It may be edited either by you before you submit it , or in negotiation with your consultant. It is drawn to protect you, the client, but should also be acceptable to your consultant. The size of the IT consultant organisation is not really relevant. But we take the view that if anything goes wrong with a major consultancy contract it will have more serious consequences than a contract with a professor at your local university. It is easy to lighten the contract if you do not want to be so hard on your consultant. This IT consultancy contract is not very different from our other consultant contracts. The differences are related to our assumption that your business requires a higher level of intellectual property protection than most, together with better control for you, the client, over matters related to work conditions and security. The IT consultancy contract provides for the specification of work to be placed in a schedule to this agreement on the first time it is used. All later assignments of work will automatically be subject to this contract.